Home » Trump's "Pyrrhic victory"
The US Supreme Court on Monday partially restored the immigration decree of President Donald Trump about the refusal to issue visas to enter the country to citizens of a number of Muslim states. According to a unanimous decision by the nine judges, the Trump's March order will be partially restored until the Supreme Court finally makes a decision on the case. The next hearing is scheduled for October. In early June, Trump appealed to the Supreme Court for a review of the decision of the Court of Appeal, which left in force a temporary ban on the implementation of the "anti-Muslim" immigration decree, which sharply restricts the admission of citizens of six countries to the territory of the United States. Previously legally competent, federal judges have already decided on blocking Trump decrees on tightening immigration measures. The decree that imposed a 90-day ban on entering the United States for citizens of seven Muslim countries (Iran, Iraq, Libya, Somalia, Sudan, Syria and Yemen) was blocked by the federal court in Seattle, Washington. The appeal will be considered by the Supreme Court in October. As a result of its consideration, it becomes clear whether this decree will eventually be implemented or completely abolished. This is also theoretically possible. 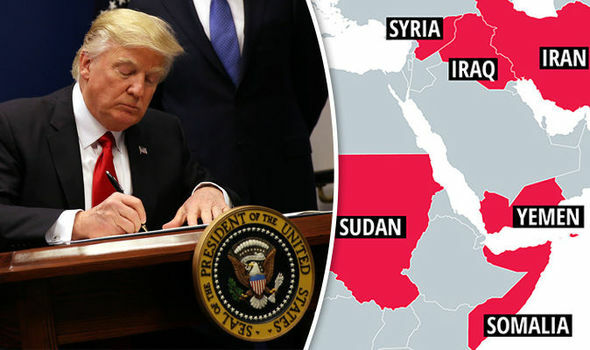 Now within 90 days only those citizens of Iran, Libya, Somalia, Sudan, Syria and Yemen will be able to enter the States, who can prove that they have "strong ties" with American citizens or companies. It's about close family relationships or documentary evidence from a job or school. Of course, the very fact of the Supreme Court's consent to consider the appeal and give effect to certain provisions of the presidential decree was taken by Trump's opponents as a temporary annoying defeat, and his supporters are still a victory. For many of them, Trump's desire to "Make America great again" always simultaneously meant more closed. For Trump himself, by the way, too. The State Department has already reported that ... recognizes the decision of the Supreme Court and executes the decree of Trump. One of the key government departments responsible for implementing the decree in many respects declares that it is loyal to its president! It turns out that in modern America this is not entirely self-evident. But, in fact, an interesting picture turns out. The US continues to stimulate and promote chaos in the world, although Trump recently promised not to do so any more. Americans continue to support terrorists in the Middle East. They are developing plans for new military conflicts. Not only in the Near and Middle East, but also in the Far. The previous administration destroyed Libya, sparked a bloody conflict in Syria, almost brought Egypt into the abyss, spawned the ISIS in Iraq. Americans are bombing around the world, ignoring international law. Capture and imprison foreign citizens in American prisons. They spy on everyone. They organize military coups and "orange revolutions" abroad. However, it turned out that it is very difficult to combat the real danger within the country. Therefore, the decision of the Supreme Court on the presidential immigrant decree is nothing more than Trump's "Pyrrhic victory". This is an imitation of the fight against terrorism. The world, however, would have been much better if they had not "fought" terrorism as they do it now.